On October 21, 2012, I went to Gillette Stadium for my first ever Patriots game, and first ever NFL game. It was awesome! The tailgating scene was impressive, the crowd was excellent, and the game was outstanding. The Pats played the Jets. They trailed their long time rivals by three late in the game before Tom Brady drove the team into field goal range, Gostowski kicked the equalizer, and the Patriots won in overtime on another Gostowski field goal and Rob Ninkovich sacking Mark Sanchez, forcing a fumble, and recovering it in the same play. I enjoyed the day. Today though, I’m not thinking of that excellent game. Before the game, I bought my first Patriots shirt. I wanted a little different name on my shirt and I wanted to show a little Connecticut love. So I bought an Aaron Hernandez shirt. He is from Bristol, CT. Then June 26 of the following year arrived and I regretted my decision. He was arrested that day for the murder of semi-pro football player Odin Lloyd. When that happened, I watched in shock as one of the best players in football was taken away in handcuffs. I didn’t think he would’ve done it. I then looked into Hernandez’s history and the case itself; I found plenty of reason to be skeptical of Hernandez’s claim of innocence. I also was saddened watching this talent get completely wasted. He grew up in Bristol, CT, and was one of the best high school tight ends in the country. He originally committed to the University of Connecticut to play with his brother, DJ. He changed his mind and went to the University of Florida instead. Under coach Urban Meyer, Hernandez developed into one of the best collegiate tight ends of the decade. He starred on one of the best college teams ever assembled. He caught passes from Tim Tebow, blocked alongside Mike and Maurkice Pouncy, was flanked by Percy Hardin and Riley Cooper for receiving work, and was backed up by Joe Haden and Janoris Jenkins on the defensive side. Yet his time in Gainesville is known more for his legal issues. Hernandez failed multiple drug tests and gained the reputation for being a guy who’d skirt the rules for a little enjoyment. However, there were two other major episodes that color him poorly. In April of 2007, Hernandez was in Gainesville and went out to a bar. He was 17 years old, consumed two alcoholic drinks, and refused to pay the bill. He was escorted up out by an employee, and Hernandez punched him so hard he ruptured the employee’s eardrum. He was arrested and charged with a felony battery charge. The matter was settled out of court with a differed prosecution agreement. Later that year, in September, Justin Glass and Corey Smith were injured when they were shot at on a street corner after just leaving a night club. Their friend Randall Carson, who was in the car and not injured, claimed that the shooter was a Hawaiian or Hispanic man with a large build and many tattoos. Hernandez invoked his right for counsel on the issue and was never charged. While he wasn’t hit for either of these incidents, Hernandez gained a reputation as a supremely gifted player but with a checkered past. If any organization could handle him, it probably would be a well run one like the Patriots. New England drafted him in the fourth round of the 2010 draft, two rounds after the team picked Arizona’s Rob Gronkowski. The team had the best tight end tandem in the league and rode their two acquisitions to a 39-9 record over the next three seasons and a trip to Super Bowl 46. Hernandez became the most dependable receiver on the Patriots roster with Gronk’s injuries and Wes Welker’s ability to drop major passes. Unfortunately for him, the Patriots, and many others, things took a horrible turn for the worst. In July 2012, Daniel Jorge Correia de Abreu and Safiro Teixeira Furtado were killed in the South End of Boston. Hernandez was indicted on these murders in 2014. He was acquitted of these on April 14th of this year. But even that is not the most damning story against Hernandez. On June 17th, 2013, Boston Bandit’s semi-pro football player Odin Lloyd was out at a night club and crossed Hernandez. Lloyd was dating Shaneah Jenkins, sister of Hernandez’s fiancee at the time. Whatever he said or did, it meant the end for him. Hernandez unloaded ten bullets into Lloyd, killing him. His body was discovered the next day and an investigation began. On June 26th, Hernandez was arrested on a count of first degree murder, one count of carrying a firearm without a license, two counts of possessing a large-capacity firearm and two counts of possessing a firearm without a firearm identification card. The Patriots released him from his contract with the team and owner Robert Kraft was stunned. He admitted that Hernandez had been a model Patriot, arriving early for work, practicing long and hard, building a strong repor with Tom Brady, and getting on Bil Belichek’s good side. Hernandez could diagram plays on a whiteboard as well as anyone and was a phenomenal football player and mind. He seemed to be exactly the perfect Patriot. But when he left the building, Hernandez refused to give up the dangerous life of the streets. He found some pleasure in the drugs, gang life, and was able to hide that under the veneer of playing for the most succesful NFL organization of the day. I went from a fan of his and owning his shirt to getting rid of it and turning the Patriots logo on the front of it into a part of a quilt I still own. I wasn’t alone in my removal of Hernandez kit. All Patriots fans did similarly to me. 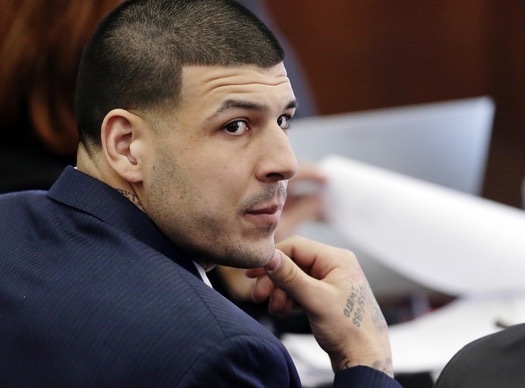 After a long trial, Hernandez was found guilty of first degree murder on April 15, 2015. Massachusetts has removed the death penalty from its potential sentences, so Hernandez was sentenced to life in prison without possibility of parole. He was acquitted of the double murder charges in South Boston only five days ago. But apparently Hernandez did not believe it worthwhile to continue his life. In the early hours of this morning, April 19th, Hernandez was found in his prison cell, dead. He had hung himself using his cell’s window and his bedsheets. How depressingly appropriate that the Patriots visited the White House today in honor of their Super Bowl win this year. 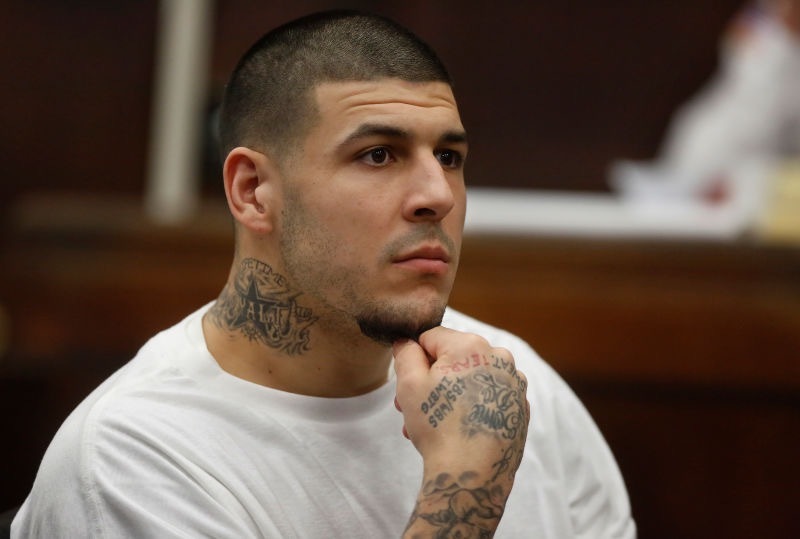 Everything about the story of Aaron Hernandez is sad. He came from a rough background, showed remarkable athletic talent, stayed on the streets in his mind, and lost his position as a reliable pass catcher for the best quarterback in the history of football because he was accustomed to gangster life. Hernandez is the most tragically wasted athletic talent of my lifetime. We saw what he could do and how he could contribute to a high level football team. We also saw how far into depravity a human being can fall. Lloyd was brutally killed over a meaningless dispute that stil remains murky to passersby. The brutal murder was capped with the most depressing way for someone to die: suicide. No one can condone or protect Hernandez for his actions. But any jokes about him committing suicide are unnecessary and crude. No one deserves that fate. It is a depressingly appropriate ending to the most tragic sports story of my lifetime. I can only pray that some good comes of it for someone who knows the story and decides that the street life is not worth it. Good Friday: He is Truly God. This is a day I anticipate with dread every year. Good Friday is the most solemn day of the Christian year. It’s when Jesus is arrested, is beaten, carries his cross, is crucified, and dies. It is at the crux of the faith, and I dislike this day above all others. 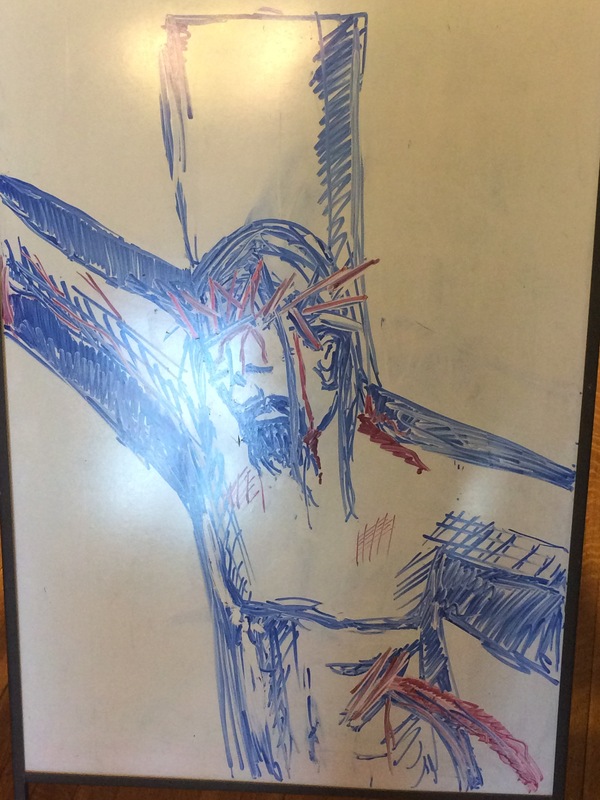 I’ve written here before that I’ve never liked Good Friday. I understand how necessary it is, but I still don’t like it for one reason: it requires the honest Christian to look into his/her heart and admit the sin bearing down upon their heart in a rather primal manner. The reminder that Jesus Christ was truly man and suffered greatly for all of our sins is wildly sobering. More details of the events that day make it even more gut wrenching. First, ever wondered what Judah’s actually got for betraying Jesus? Well, 30 pieces of silver was about 5 week’s paying wages. So he betrayed Jesus for 5 weeks worth of money. In terms of actual spending power? Each piece was worth about $20. That means he betrayed Jesus for a total of $600. Yes, it costs less for an apartment in Malden than it does to betray the Son of God. I read that during a Bible Study I’m a part of and my jaw dropped. Then the amount of pain he went through is just stupifying. Every year, I watch The Passion of the Christ on Good Friday. The amount of suffering Jesus went through and the way the film depicted it was raw, brutal, and shocking. And he did all that for you, me, the temple guards who beat him up, the man who betrayed him, the holy and sinners alike. All that for us. Truly God does love us. There is also one scene in the movie that leaves me in tears every time. After Jesus takes up his cross and walks to Golgotha, he falls under the weight of his cross. In one such moment, he meets his mother. They cut in a sequence of Jesus falling as a child and show Mary’s motherly love when He was a child and an adult. This scene destroys me every time. God was human flesh. God walked the earth and had a mother who suffered as she watched her son be beaten to a bloody pulp of a man. And she loved him. Jesus was true man and true God. It’s always a trying day because of how incredible this faith and journey is. Take time today to reflect on Jesus’ sacrifice for us. Throughout college, I was active in the Catholic community we have at Boston University. I maintain that it was the best part of my collegiate experience. I learned how to pray, reflect intently on my life, and live with true joy. More than anything else, the BUCC shaped me into the guy I have become. And out of all the offered programming there, the semesterly retreats had the biggest impact on me. In the Catholic world, a retreat is a time of reflection, prayer, and contemplation. It’s a time when you leave home, get away from your life, and follow the Spirit to see where God is calling you in a much different setting than normal. While in college, there was one retreat each semester. I went on all eight undergrad retreats I was eligible for. They all meant something to me and affected me in some way. My freshman retreats sparked my faith to life. Sophomore year’s Autumn confirmed I was on the right path and the spring let me work on a retreat, so I saw the behind the scenes stuff. Junior year comforted and consoled me through some difficult times. And senior year closed out college with a bang. I wasn’t sure if I’d be able to do anymore retreats like those after college. They’re special experiences and only happen so often. I stayed around BU this year. I still have friends in undergrad at BU and I got more into the graduate student and young professional group that’s just getting its footing within the community again. We had talked about doing retreats for our segment of the CC, but I wasn’t sure that it would happen. I went to SEEK in San Antonio in January and figured that would be my retreat. I loved it! I was content that God had given me the needed lessons and retreat experience that I hadn’t had in almost a year. Thank God I was wrong about that. At the end of January, a friend in the BU Grad Group told me about the retreat being discussed and asked if I wanted to help make it happen. Without thinking about the timing of it or considering too much, I said yes. It seemed like I shouldn’t pass on the opportunity to do it and I’m so happy I did. By fortunate timing, the retreat fell on the weekend between the NCAA Regional tournaments in Manchester and Providence, both of which I covered, and the Frozen Four in Chicago, where I will be starting on Tuesday. I didn’t think about that scheduling when I said yes but thank God He did. We got to discussing the theme, title, structure, schedule, and we went to work. We didn’t have an existing framework for prior Grad Group retreats, so we took a beat from the undergrad retreats we were familiar with and crafted our own formula. It took months of planning, promotion, praying, and processing to make it all happen. And when the weekend arrived with the snow, sleet, rain, and everything else that happens in winter and not on April 1st, we were ready to go. We went to Acton Mass and went Into the Desert for the weekend. It was awesome. The priest who gave the talks was perfect, the witnesses were phenomenal, the meditations worked well(so I was told after leading the first one and experienced the second), and the time in adoration and confession was nothing short of amazing. I barely slept over the weekend, in part because we slept in sleeping bags on the floors of a classroom in the basement of the church and because my sleep spot was right next to the door, but that didn’t matter much. The weekend was just such an awesome time that I didn’t care exactly when stuff happened or how rested I was. I ran on the Holy Spirit for energy all weekend. I completely crashed when I got home, but oh well. It was needed. I can add this to the expanding memory bank of incredible moments made possible through the BUCC community. The retreat to St. Elizabeth of Hungary parish was lovely. The snow made things annoying at times and cold, but that was alright. The simple yet deep programming worked better than we hoped it would. And the healthy parish community at St. Elizabeth’s made things better. The working infrastructure at the church made our event possible and reminded us that there is life after college. Many of us come from parishes that are older and low in people our age. St. Elizabeth’s has plenty of families with young parents, teenagers, active high schoolers, and adorable children in addition to the older crowd. It’s good to know that churches like this one exist and that they can be formed in today’s world. It’s also good to be reminded that God guides us through our deserts and makes good from them. We spent the retreat focusing on spiritual dryness and anything that resembles a desert in the spiritual life. I haven’t processed everything that God showed me yet and I will continue working through my time in the talks, witnesses, discussions, meditations, Masses, and everything else that happened. What I have processed is a reminder of God’s love for me, a purpose for my spiritual battles in recent years, and reassurance that I’m in the right career. Retreats have always served as a time for me to reset and refresh. This weekend didn’t physically do either of those; I went home physically exhausted. I fell asleep at 4, woke up at 7, then fell back asleep until 5am. I was rested after that night’s sleep though! Spiritually though, I feel more alive than I have in a while. I reconnected with people I hadn’t seen in a while, met new people, and was reminded of God’s presence throughout my life. It was exactly what I needed. I can say that about every single retreat I’ve been on. I’ve got more to learn from what happened this weekend, but I know I got plenty out of it for now. I’m thankful I had the best crew possible to work with on this weekend. The Desert isn’t as bad a place as people make it out to be.